Alan Mathison Turing was a code breaker and pioneer of computer science who was eventually prosecuted for being gay. Turing was born at 2 Warrington Crescent, London but spent most of his childhood in Hastings, where his parents left him and his brother with a retired Army couple, Colonel and Mrs Ward, in a large house, Baston Lodge, Charles Street, St Leonards, while his father worked as a colonial administrator in Madras, India. Across the road was the house of Sir Henry Rider Haggard, the author. Turing went to boarding school in Sherborne, Dorset, where he fell in love with another boy at the school, who suddenly died of bovine tuberculosis. This loss destroyed Turing’s religious faith and he became an atheist. Consequently Turing adopted the conviction that all phenomena, including the workings of the human brain, must be materialistic. In 1931 Turing studied mathematics at King’s College, Cambridge, being elected a Fellow at the age of only 22. In the same year he invented the abstract computers now known as Turing machines on which all subsequent stored-program digital computers are modelled. Working independently, Turing and Alonzo Church in the US both showed in 1936 that there are well-defined mathematical problems that cannot be solved by effective methods. This expanded on the work of the Austrian logician Kurt Godel published in 1931, that there can be no consistent, complete formal system of arithmetic. During 1936-1938 Turing continued his studies, at Princeton University. He completed a PhD in mathematical logic under Church’s direction, analysing the notion of ‘intuition’ in mathematics and introducing the idea of oracular computation in mathematical recursion theory. At the outbreak of war in 1939 he joined the Government Code and Cypher School (GC&CS) at Bletchley Park, Buckinghamshire. Building on earlier work by Polish cryptanalysts, Turing contributed crucially to the design of electro-mechanical machines (‘bombes’) used to decipher the German ‘Enigma’ code and also worked on the ‘Fish’ codes. Turing received the OBE for his wartime work. In 1945, Turing was recruited to the National Physical Laboratory (NPL) in London, to design and develop an electronic computer. The Automatic Computing Engine (ACE) was the first relatively complete specification of an electronic stored-program general-purpose digital computer. The first working computer was however built by the Royal Society Computing Machine Laboratory at Manchester University, where Turing became effectively Director in 1948. Turing was elected a Fellow of the Royal Society (FRS) in 1951. In March 1952 however he was prosecuted for homosexuality, then a crime in Britain, and sentenced to a period of twelve months hormone ‘therapy’. This and other pressures, such as loss of security clearance, led to his suicide two years later, by eating an apple laced with cyanide. It was not until 2009 that – following a petition – an apology for his treatment was issued by Gordon Brown – the then Prime Minister. 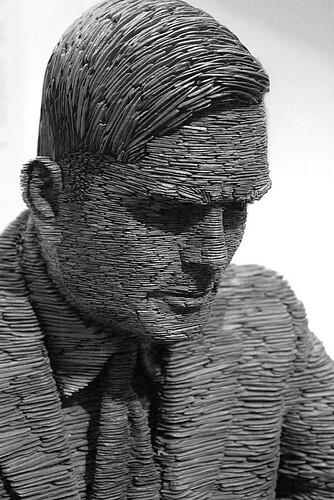 There are statues of Turing in Sackville Park, Manchester, the University of Surrey campus and Bletchley Park. Memorial plaques mark Turing’s birthplace and childhood home in Warrington Crescent, London, now the Colonnade hotel his former residence, Hollymeade, in Wilmslow, Cheshire. The Alan Turing Building at the University of Manchester houses the School of Mathematics, the Photon Science Institute and the Jodrell Bank Centre for Astrophysics.